Bonney Lake is one of the youngest communities in Washington State. As late as 1946 it had no access to water or electricity and its few roads were made of dirt. Today is it a bustling city with close to a thousand businesses. 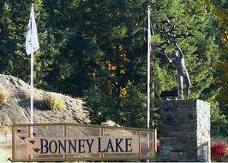 There are many very nice homes in Bonney Lake, and most can be bought at a very affordable price between two and three hundred thousand on average. There are also several hundred foreclosures and reos currently available, making the market popular with discount hunters, real estate investors, and first time buyers. Located on the western edge of the Tacoma metro region, many buyers are interested in moving into the city and are actively looking for bank owned homes and fixers in short sales and or at auction. Almost any kind of Bonney Lake REO can be found and researched online @ www.vipteamwa.com including photos and virtual tours of the property. One of the exciting tools on the VIP Team site is the easy to use MAP. Buyers can go to a specific area and search for Bonney Lake foreclosures and bank-owned homes. With this feature, searchers can see all the current condos and homes for sale in that area, especially useful for those seeking Bonney Lake foreclosure homes near the workplace or other specific locations such as schools. Property type and size is, of course, a major factor when buying a home. The Bonney Lake foreclosure home market has a wide variety of property types. Our search tool allows buyers to zero in on the kind of property that meets their needs. Users can quickly sort by multiple criteria such as location, square footage, number of bedrooms, lot size, etc. Our website even provides search criteria choices for those seeking views and waterfront properties as well. Whether you are a family just moving to the area, or a young professional relocating, our site can help you find what you need in the Tacoma foreclosure home market. Price is always an important factor and there are a wide range of prices throughout the Bonney Lake foreclosure home market. VIPTeamWA.com allows buyers to search specific prices, or enter a wide range from minimum to maximum price. For buyers with cash or pre-approved loan amounts, this lets them concentrate their search on foreclosures and Bank owned property they can afford. Our agents will gladly assist you in the Search for Bonney Lake and surrounding area properties.